Goodbyes can be tough, especially when the person bidding farewell has been so impactful. 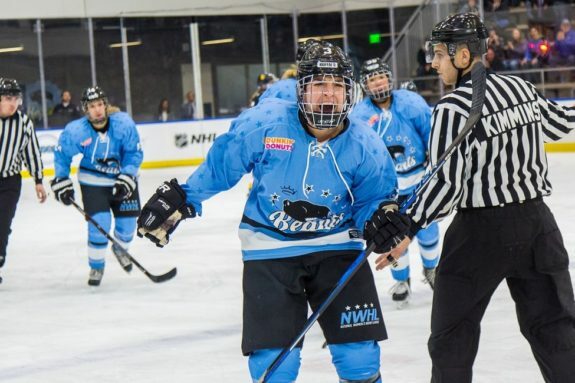 The Buffalo Beauts announced on Jan. 7, 2019 that veteran defender Sarah Edney had played her final game with the organization during the team’s 5-0 victory on Jan. 5 against the Boston Pride. The decision was mutually agreed upon between the Beauts and Edney prior to the 2018-19 NWHL season getting under way. Jan. 5, 2018’s showdown between the Buffalo Beauts and the Boston Pride was defender Sarah Edney’s final game for Buffalo (Photo Credit: Pat McCarthy). The 25-year-old blueliner is moving to Australia where she will be attending dental school. In a relatively short time span, the Mississauga-born defender made her mark on the organization. Edney spent a season and a half in Beauts’ blue and sparked some vivid memories during her stay. We look back on five particular moments from Edney’s career with the Beauts that we feel most distinguish her time in Buffalo. On Oct. 28, 2017, the Beauts opened the 2017-18 NWHL regular season on the road. This was the start of Edney’s first season in Buffalo. The team put their newly pronounced leadership on display as they faced the Connecticut Whale at Terry Conners Rink. In addition to Corinne Buie serving as Buffalo’s team captain, both Edney and Jess Jones would fulfill the roles of alternate captains. The fact that Edney would be thought so highly of to have garnered the “A” right from the get-go was noteworthy in and of itself. Keep in mind that this particular Beauts team were the reigning Isobel Cup Champions. 10 players from the 2016-17 squad still remained on the team at that point, and any one of them could have assumed the duties of alternate captain. Instead, it was the newcomer Edney (Jones was a newcomer too) who received the nod. It would be remiss to not mention that deciding factors for selecting Edney for such a role likely included her four solid seasons of NCAA hockey at Harvard University and her two prior professional-level seasons in the CWHL with the Brampton (now Markham) Thunder. While Edney may have been new to the Beauts, she certainly was not new to playing elite hockey. 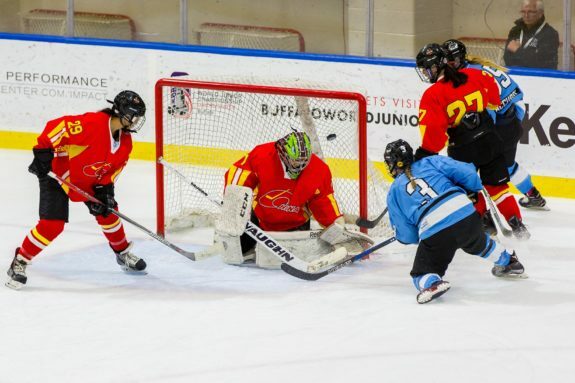 Prior to the 2017-18 NWHL regular season getting underway, the Beauts played a preseason game on Oct. 9 against a collection of players from China – the majority of whom were members of the Chinese Women’s National Team. While there would be no implications on seasonal play, the contest was still an early opportunity for the Beauts to test their mettle and to gel as a team. By no means would the exhibition game be a cakewalk. Indications from the opening period made a Beauts victory appear in serious doubt. China went up 2-0 within the first 20 minutes on goals from Jessica Wong and Rachel Llanes. It would be a different story in the second period. Hayley Scamurra would get the Beauts on the board with an unassisted tally at 4:07. Buie would tie it up at 2-2 when she converted less than four minutes later. Sarah Edney scores the game-winning goal for the Beauts during an Oct. 9, 2017 exhibition game against China (Photo Credit: Michael Hetzel). What would truly seal the deal for Buffalo though was the efforts made by Edney. While playing on the top defense pair with Jacquie Greco, the two blueliners jumped into the rush and created chances all throughout the game. Once the score became knotted, it was Edney who would become the difference maker. With Beauts forward Taylor Accursi helping to chip a puck out to the front of the Team China net, a quick scramble ensued. Edney – who had worked herself down low – pounced on the loose puck from one knee and fired it into the top of the net. Edney’s goal would end up being the game-winner, as the Beauts would go on to win 4-2. Additionally, she was the only skater on Buffalo to post a plus-2 or better that game. While the Buffalo Beauts and their fans may have recognized early on that Edney was a standout talent, the rest of the NWHL would take note in February 2018. She would be one of eight Beauts named to the 2018 NWHL All-Star Game in St. Paul, Minnesota. With the All-Star festivities taking place the weekend of Feb. 11 and 12, Edney had already contributed much leading up to Minnesota. Prior to that weekend taking shape, Edney had played in 11 regular season games for Buffalo. In the process she had scored a goal and added three assists. She had also fired 25 shots on net within that stretch. 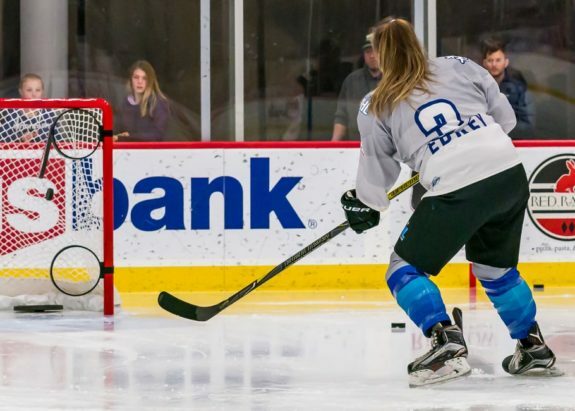 In addition to playing on Team Leveille in the All-Star Game itself – fellow Beauts teammate at the time Amanda Leveille was one of the captains for the game – Edney also took part in the shooting accuracy challenge in the skills competition. The final game of the 2017-18 regular season belonged Edney. Just as they had begun the campaign, the Beauts ended the season on the road in Terry Conners on Mar. 10, 2018. Up against the Whale once more, Edney came as close as possible to single-handedly leading her team to victory. With Buffalo winning the game 4-1, Edney scored on both of the shots that she took that game. Her first tally was the game’s opening score. With the Beauts on the power play and Connecticut’s Emma Greco in the box for a delay of game infraction, Edney captured the puck at the far point and corralled it. Firing almost immediately, the shot went through heavy traffic and ended up in behind Whale goalie Sydney Rossman. If that were not enough, Edney would add the icing onto the cake when she scored an empty-netter with 32 seconds remaining in the game. 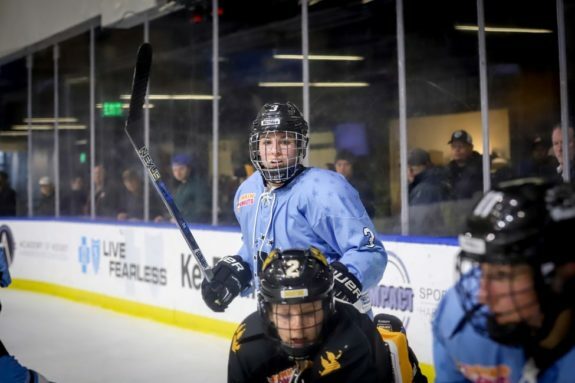 Defender Sarah Edney never hesitated to jump into the rush with the forwards during her time with the Beauts (Photo Credit: Pat McCarthy). The two-goal performance was the perfect way to get her team primed for the playoffs. Knowing that with their regular season finish of 12-4 – thus securing home-ice advantage for the opening round of the playoffs – the stage was adequately set for Edney and her teammates to bring something special to the hometown Buffalo faithful. No matter where she may go from here, there is one pinnacle moment in Sarah Edney’s career that shall always endear her to Buffalo fans. More than 900-plus fans packed the HarborCenter on Mar. 17, 2018 to share in the first home playoff game in Buffalo Beauts history. The Beauts would face the Boston Pride, whom they had dispelled the season prior to win the Isobel Cup. The rink was absolutely electrified by the excitement permeating from the fans. What they ended up witnessing that afternoon would send them over the top. In two career playoff games, Sarah Edney has a goal and an assist for Buffalo (Photo Credit: Michael Hetzel). Even though it was fellow defender Sarah Casorso who would win it for the Beauts 3-2 in overtime, the first home playoff goal will forever belong to Edney. At 10:53 of the opening period, Edney jumped up into the rush and came both barrels blazing towards Pride goalie Brittany Ott. Skating at top speed, she fired a shot into the top-right corner of the net past Ott. At that moment, the HarborCenter erupted as it never had before. A little known fact: the puck from the goal that Edney scored was recently acquired by Beauts longtime public address announcer Ryan Burgess. In true Edney fashion, she autographed the puck for Burgess shortly after her final game as a Buffalo Beaut. Edney finished her NWHL career with three goals and four assists in 24 regular season games. Additionally, she leaves with two points – a goal and an assist – in her two career playoff games. Along with the five moments we mentioned – ones to always remember her by – we give a heartfelt “not goodbye, but see you later” to Edney as well. The 2018-19 Beauts may be the strongest collection of talent in the NWHL today, but it will be hard to fill the skates of one of the better defenders this organization has seen. Thank you, Sarah, for your efforts that helped bring the team to where it is today. Perhaps more importantly, thank you for your efforts for Buffalo sports.